Beyond Limits was a really good read, with a horrifyingly realistic terrorist plot that makes you feel their race against the clocks, the suspense was top notch. The main characters as well as the secondary characters were well written and realistic and the romance was hot. I really enjoyed reading it. When one of Derek's missions uncover a terrorist plot he finds himself being questioned by FBI agent Elizabeth. They've met previously in a different investigation and neither one has been able to forget the other. Derek has a vested interest in seeing the suspects caught not only because the plot is supposed to take place in his home state but because one of his teammates was killed in the op involving one of the suspects. Elizabeth finds herself stuck with Derek as they race to catch the terrorists before they can cause any destruction on US soil. While I'm not usually a reader of terrorist plot lines, this one was pretty good with enough twists and turns to keep me interested. Derek and Elizabeth actually worked really well together when they got over their hangups. Because Derek and Elizabeth have met previously there isn't a feeling of being rushed into their relationship. They are both seriously attracted to each other and that really comes through while you're reading. I also enjoyed reading about Luke and Hailey and I'm really hoping that they get their own story eventually. 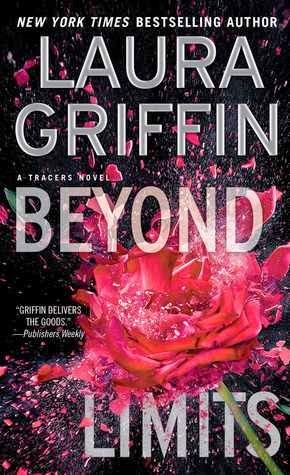 There were only a handful of scenes with them but I found myself looking forward to them while reading, which shows just how well Laura Griffin writes her secondary characters. Although Beyond Limits is the eighth book in the Tracers series it can be read as a stand alone, each of the books focus on a different couple, and even though Derek and Elizabeth were both introduced in a previous book I had no problem picking up this one without reading the others first. You still get the back-story of how they met so don't worry that you'll be lost if you're starting with this one. Overall Beyond Limits is a great read with lots of action and some scorching hot romance to spice it up.